2 How does it work to build muscle? 3 Are prescription injections legally attainable? 6 Are there ways other than HGH supplements to stimulate secretion naturally and cost-efficiently? 8 If this is true, how do all those companies selling this crap get away with all their claims? The HGH supplements train has left the station and is picking up speed. With recent media attention on athletes who have used HGH (Human Growth Hormone) to enhance their performance, this is a train that isn’t likely to slow down in the near future. But, for the time being, you are probably best to keep your money and not buy a ticket on this train, at least not the one that is being offered in supplement stores and ads across the web. The HGH supplements you see in these places, the pills and sprays (they call themselves enhancers, releasers, precursors or secretagogues), don’t contain the actual hormone (or they contain trace amounts that can’t be absorbed orally). While this fact may be hard to discern based on these products marketing and packaging, HGH is only available in the US with a prescription. Instead, these products are simply trying to capitalize on the buzz created by prescription injections. They report the findings of studies on the effects of prescription injections and try to convince you that their HGH supplements are a “breakthrough” way to increase your natural secretion of the hormone. There is little or no evidence to suggest that these products deliver what they claim. While it may be possible for them to have a positive effect on your natural secretion, this effect isn’t going to be significant enough to attain the results demonstrated by prescription HGH. And it isn’t going to be greater than you can receive eating a healthy muscle-building diet. In addition, these products usually come with high price tags – higher than other natural supplements simply because injections can be a very expensive proposition. This expense for the good stuff drives up the price for the knock-offs (you can get more for a fake Rolex than a fake Timex). First off, HGH is not a steroid as is commonly believed. Anabolic steroids are synthesized derivatives of the male hormone testosterone. HGH is a hormone secreted by the anterior pituitary gland which stimulates growth in the body. While this hormone is made in sufficient quantities throughout your lifetime, the amount that is secreted (controlled by the pituitary gland) lessens as you age for reasons not yet fully understood. The gradual lessening of HGH levels in the body is thought to be one of the biggest causes of symptoms of aging. Injections have long been used to treat children who suffered from severe growth retardation. The problems of the past were that the only HGH suitable for this treatment had to be harvested from human cadavers. Modern technology has allowed science to create synthesized (recombinant) HGH. With the relatively recent availability of the synthesized versions of the hormone, the studies into the effects supplementation can have on healthy adults has really just begun. Early study results have shown promise that prescription injections can help to reduce and even reverse symptoms of aging including increasing energy, healing, brain function, bone strength and general health. Of interest to bodybuilders, it has been shown to help build muscle mass and decrease body fat. How does it work to build muscle? 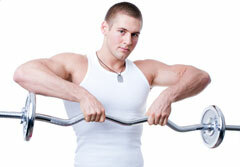 The body’s ability to build muscle is dependent on many factors including hormone levels. Many hormones contribute to the muscle building process and one of those hormones (a very important one) is HGH. Its biggest contribution to muscle building likely comes in an indirect way. The majority of HGH’s ability to create muscle growth is believed to rest in its ability to signal the body to release IGF-1. These two hormones affect the metabolism of proteins, fats and carbohydrates. Higher levels signal increased amino acid uptake and protein synthesis within muscle tissue. In short, they encourage anabolism and discourage catabolism. Are prescription injections legally attainable? Yes. Many doctors will prescribe injections for anti-aging effects. Additionally, many anti-aging clinics are popping up with their main business being doling out these prescriptions. You can also get anabolic steroid prescriptions this way. You must however be 35 or over and have some money to burn as the costs can be significant. Yes, you can legally sell HGH as long as the dosage is in trace amounts. This is defined at about 2,000 nanograms (ng). How significant is that? Not very. The average 30 year old naturally secretes about 400,000 ng a day. An HGH injection contains about 350,000 ng. Increasing your levels by less than 1% is unlikely to have any noticeable effect at all. But that isn’t the real problem with these claims. The real problem is that HGH is too large a molecule to be absorbed through oral supplementation. So, while the product may indeed contain real HGH, it will simply be broken down before reaching your blood. You’re just getting a really, really expensive protein source. With the relative recent availability of the treatment, the risks have yet to be defined. In children, excessive HGH secretion can cause a condition known as Giantism. In adults, excessive secretion can lead to a condition called Acromegaly, which is typified by a gradual lengthening of bone and connective tissue to create coarse features. One could argue that prescription HGH’s most famous user, Barry Bonds, shows signs of this side effect in his facial features. Other risks include metabolic changes. Due to the newness of availability, long term risks of injections have not been adequately studied. Are there ways other than HGH supplements to stimulate secretion naturally and cost-efficiently? Exercise – Consistently training with intensity can encourage secretion. Hydration -Dehydration can negatively influence secretion. Yet another reason to drink lots of water. Sleep – Your sleep time is often the missing ingredient needed to successfully build muscle mass and this is just one reason why it is so important. HGH secretion follows a circadian rhythm (cycle based on 24 hour clock) with the largest secretion occurring in the first 1-2 hours of sleep. Disruption of sleep can negatively influence secretion. Instead, get consistent and adequate sleep and you can positively affect secretion. Nutrition – As HGH is a protein hormone made up of about 190 amino acids, this is another reason why protein is so important to the diet of those trying to add muscle mass. Eating a diet high in protein with a good selection of amino acid profiles can encourage secretion. A post-workout meal heavy in protein may be most important for this purpose. Essentially, many of the HGH supplements being sold today are basically just vitamins coupled with protein blends sold at an inflated price. Glutamine is one amino acid that has been shown to help increase HGH levels and supplementing additionally with it may be a good idea for many reasons. Paying attention to the four items above (which you should be doing any way if you are trying to build muscle mass) will undoubtedly get you a lot further towards maximizing your natural secretion of this important hormone than any of the HGH supplements out there (and be a lot easier on your wallet). If this is true, how do all those companies selling this crap get away with all their claims? It is a mistake to feel secure that the government is closely monitoring these companies. Recently, the FDA actually did take to court a couple of companies selling HGH supplements through ridiculous claims. The settlement had the companies paying millions of dollars in fines. Did this scare the other companies selling the same bogus products in the same way? Nope. The FDA/FTC simply don’t have the manpower to go after all the companies and the companies know it. They will take their chances (making 800% profit on a hot-selling item tends to be a pretty powerful motivator). For more on the supplement hype and the regulation (or lack thereof) of the supplement industry, check out Bodybuilding Nutrition: Avoiding Supplement Hype.